This post is sponsored by Holy Heroes. Is it just me, or is Lent painfully early this year? I feel like I’m still recovering from Christmastide. On the other hand, I’m a big Lent fan. I love that the Christian Year offers us a time set aside to clean house. And no, I’m not talking about my dusty baseboards, although that would be a good thing to tackle during Lent, too. I’m talking about our souls. 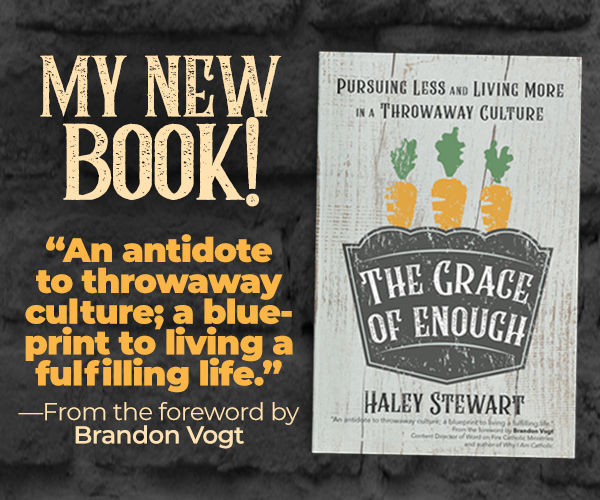 It’s the chance to strip away distractions so that we have the vision to see ourselves as we are–how much we need God’s mercy–so that with his grace working in our hearts we can become more like him. But while I’m starting to feel like I understand this Lent thing, I’m still a newbie at observing Lent with my kids. So here’s a few things we’ve tried and a few things I aspire to do this year! 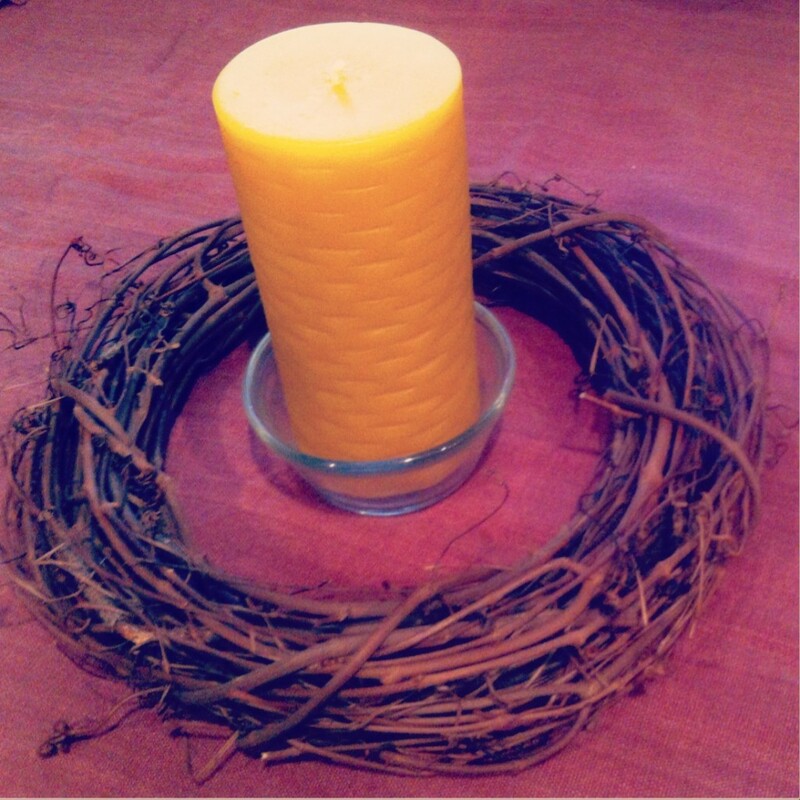 During Advent we have an Advent wreath on the table, during Lent we switch to a simple grapevine wreath, light a candle each night, and use the grey-ish-purple tablecloth. We also cover our crucifixes and sacred art with purple cloth. In the past we’ve done this on Ash Wednesday, but I read that it should actually be done on the Fifth Sunday of Lent. We make a game of finding all the crucifixes in the house when we veil them and then the kids LOVE unveiling everything on Easter morning when it’s time to celebrate! We typically don’t eat meat on Fridays all year long simply because if I plan to do a different Friday penance I inevitably forget to do it. So this isn’t a big change for us, but it’s a good weekly reminder to explain why we won’t be eating bacon with breakfast on Friday mornings. Kids notice changes in the meal plan. Especially if the change involves a lack of bacon. 3. Pray the Sorrowful Mysteries as a family. 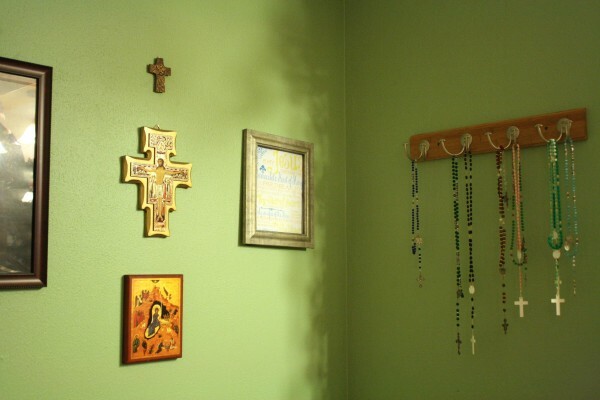 For a long time we were too intimidated to try to pray the Rosary as a family, but a spiritual director encouraged me to nurture this tradition in our home, so we gave it a shot. Our kids are ages 6, 3, and 1. And the six-year-old and one-year-old are of the wiggly/climb the walls persuasion. Our three-year-old is of the three-year-old persuasion (AKA emotional volcano of insanity…it’s just how three is). Everybody has their own special rosary to hold. We gather in a corner of our living room that has our sacred art on the wall so there are things to look at. Sometimes we light a candle to set the mood. We make a big deal over good behavior during prayer (obviously different expectations for different ages). 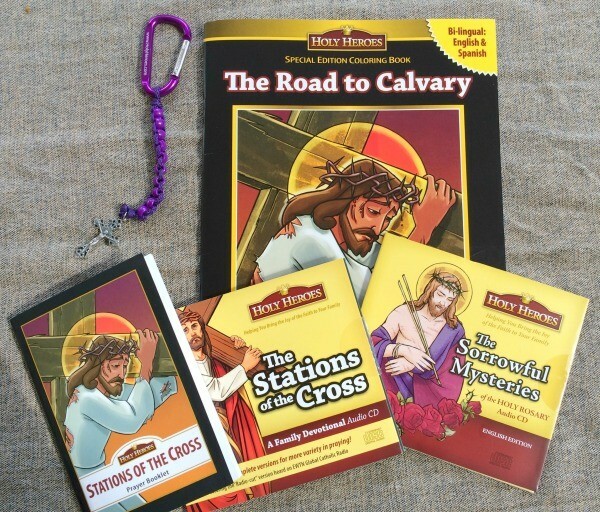 The kids also love listening to the Rosary CDs from Holy Heroes and I think they really help to both make the prayers familiar AND to help them understand each mystery. Lucy actually demands to listen to the Sorrowful Mysteries during nap time. I’m not gonna try to figure that one out, I’m just going with it. The Rosary is recited by children and I think hearing children’s voices is key. If I can pry the CD out of her fingers, I plan to keep it in the car during Lent for us to listen to when we’re driving around. 4. Learn about Jesus’ life and ministry together. While it makes sense to focus on stories of God’s redemption that lead up to Jesus’ birth during Advent, Lent is a great time to focus on the life of Jesus and his ministry. We love reading the New Testament section in Tomie de Paola’s Book of Bible Stories as well as his The Miracles of Jesus. 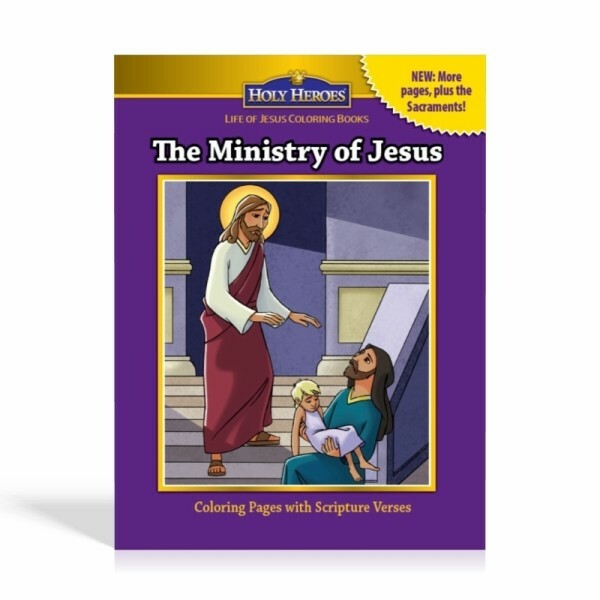 I also love to pull out the Ministry of Jesus Coloring Book by Holy Heroes (which is free with any purchase for Carrots readers, more on the details at the end of this post). I’m kind of a coloring book snob, but I find the pictures to be really attractive and I’m a little obsessed with all the Holy Heroes coloring books. 5. Give kids a sense of Lent as a journey. Easiest liturgical crafty thing ever for this uncrafty mama. Rock, write alleluia on it, bury it. (But seriously, don’t forget where you buried it or else Easter Sunday’s a little anti-climactic…lesson learned.) Then I try to point out to the kids when the alleluia is missing from the Mass during Lent. 7. Learn a new prayer and hymn together. During Advent we learn an Advent song together as we light the candles at dinner (O Come, Divine Messiah) and I’d like to do the same thing during Lent! Any recommendations for favorite lenten songs? Last year we learned the Memorare as a family and now it’s my three-year-old’s favorite prayer. Not sure which one we’ll learn this year! 8. Have a “Bits and Pieces” Meal/Meatless Meal. 9. Go to Stations of the Cross. And here’s some great news! Carrots readers can receive a free Ministry of Jesus Coloring Book with any purchase from Holy Heroes. The coupon code is l3ntc4rr0ts so just add the coloring book to your cart and enter the coupon code at checkout to make it free! So head on over! Do you have any tips for observing Lent with kids? I wanna hear ’em in the comments! Disclosure: This post is sponsored by Holy Heroes. All opinions are my own. I only share about products I love. I have three boys, ages 9,7 and 4, the older two with autism. We find it very helpful to play a rosary video every evening to help us pray the rosary together as a family! It keeps us from accidentally praying 37 Hail Marys in a decade, and 3 in another. Thank you for this post! That is a great idea, Jane! What video do you use? Great ideas and suggestions Haley! What about, for your new prayer, you memorize the one at the end of the rosary. The “Oh God, whose only begotten Son….” I don’t know what it’s called. I also LOVE the Holy Spirit prayer (“Come Holy Spirit, fill the hearts of your faithful…”) and that would be a great one to pray together as a family. Now I need to take my own suggestion! We used a video when ours were small for saying the rosary too. We recorded each day of the week on EWTN with Mother Angelica and the Nuns (which also counts as vocation promotion for the girls) and the Holy Land Rosary as well so that they could see the actual places the mysteries took place and we varied those. With so many small children at once, I could stop as often as I needed to and help one or more of them to be on the right beads and Mother Angelica or Father Mitch would keep the rosary going for the others while I did. It also helped them to focus on the mystery and to learn more about it. Best thing we ever did! Now we use the small Magnificat Rosary Companion booklet because we pray the rosary on the way to morning mass in the car which minimizes the distractions whizzing by on the road. Here are a few of our favorite prayers to add during the Great Fast. The 1st & 3rd prayers are commonly prayed (or chanted) by Eastern Catholics. ANIMA CHRISTI (Body of Christ) — This prayer is so beautiful! Ooooo! I love the Anima Christi, but I’m never had it completely memorized. Wow, these are great ideas. Lent with kids is something I need help with. Advent was so easy — little baby Jesus is “so cute!” as my 3yo says. And my daughter LOVES Mary because, of course, she is a mama to her baby dolls, so they have that in common. 🙂 Lent is tough, though. I agree. Lent is tougher! 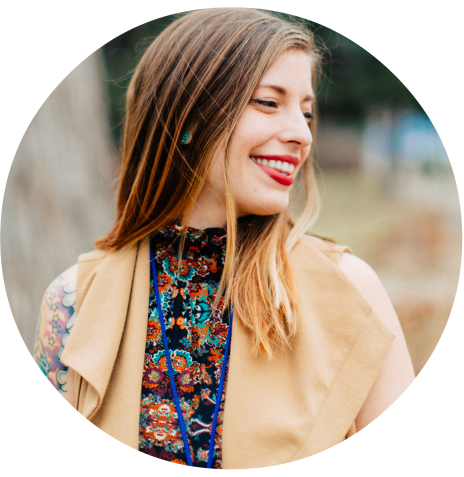 Lent is my favorite liturgical time because it forces a slow down and creates this space of routine where contemplation comes out of expectation. Your activities are such great ideas. We need to get back to the family rosary! Last year, I had a success with teaching the kids an Invitatory Pslam (I used 95), so this year I might add saying one hour out of the Divine office to our morning session. YES. I just love it, too. I would love to add baby steps of the Divine Office to our day. I need to re-read the little oratory! Something we started doing last Lenten Season was keeping all of the Christmas cards we had received in a basket by the dinner table. At dinner prayers we pull a card from the basket and pray for that family. If you toss out your Christmas cards, then have the family write names on pieces of paper and put those in the basket. I love this idea….will try to remember for next Christmas/Lent! Great ideas! I love the Stations of the Cross box idea from Bonnie. We did it last year and my girls loved it. P.S. The coupon code to get the free coloring book didn’t work? Great post! We’re adding the rosary this year. I also tried the coupon code. It said it was not valid. Make sure to copy and paste the coupon code. You will also need to add the coloring book before adding the coupon code. Amy and Ellen, did you get it to work? As Jenny said above, you have to be sure to copy/paste and add the coloring book to your cart before you add in the code. Lemme know if you still have trouble! I had added the book and copied and pasted the code when I first tried it. I tried it again, and it still said the code is invalid. Oh no! I just tried it, Amy, and it did work for me. In the instructions I mentioned that the coloring book is free with any purchase. Do you think the problem was that it was the only item in your cart? I can contact HH if you’re continuing to have trouble! I don’t understand why it won’t work for me! I do have some other things in my cart too. I just tried it again and it still didn’t work. I love the idea of saying the rosary as a family. I have been too intimidated by squirmers to try, but this Lent, we are doing it. thanks for the inspiration! Yeah! You can do it! Even if you just make it through one decade, that’s great right? Ditto what Sully said, but maybe we’ll give it a go. Maybe. We like to sing the Stabat Mater (in English) during Lent. Short, easy to learn verses, and it is sung at our parish stations of the cross and reinforced that way. I also like to teach them the hymn O Sacred Head Surrounded. We also pray the sorrowful mysteries during Lent. The kids can color a picture for each station and then we back them with purple paper and hang them up so they can refer to them as we pray. I think I found our coloring pages at Jennifer Miller’s blog. I have always wanted to cover the statues and crucifixes! Maybe this year! LOVE your idea to learn the Stabat Mater and O Sacred Head is one of my favorites ever. Can’t believe I didn’t think of that one! Thank you! This is such a great list (and I’m totally pinning it so I can come back and look through it again later). We’ve done Holy Heroes for Advent for the past two years and I’m really excited to try it with the kids for Lent this year. I also love the idea of burying the Alleluia and of having a leftovers meal once a week. Thanks for sharing these resources. I’ve really struggled to know how to mark Lent too. For the past couple of years we have read what takes place each day in Holy Week from the gospels each tea time, and re-enacted washing our children’s feet etc. But I’ve really wanted something for the whole of Lent. Eventually this January I decided to write our own mini Lenten devotional (so I am totally with you on the “How is Lent so early this year??!! ), There will be a few late nights this week finishing it off, but it’s also great to have been signposted to the Holy Heroes, which I’ve signed us up for too. What about “The Glory of These Forty Days” (very easy tune, Scripture references galore)? Perhaps maybe more kid-friendly, “Were You There?” – Johnny Cash and the Carter sisters have a version that has a high lonesome sound your kids might dig. 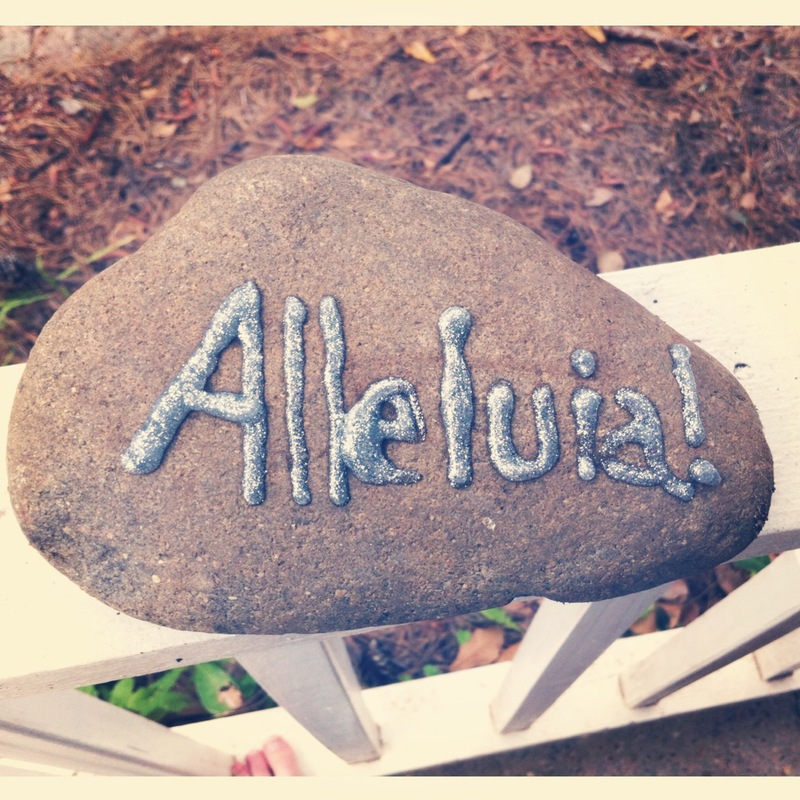 Why do you bury the alleluia rock? Sorry for my ignorance! I would like to know the significance though. Great post, I appreciate the suggestions! Hey, Haley! Any suggestions for Lent music? I LOVED your post/podcast about Advent music – it really set the tone in our home and prepared all of us for Christmas. I’d love to be able to do the same for Lent. I heard there is a Lent at Ephesus by the Benedictine Sisters and someone at church mentioned Stabat Mater (though I’m not sure which version is a favorite?). Any other ideas? Does Marian Grace have any Lent songs? I love Lent at Ephesus! And I would definitely recommend Marian Grace, even if it’s not all “lenten.” Also, there’s some good Lent music in Handel’s Messiah! And maybe St. Matthew’s Passion?